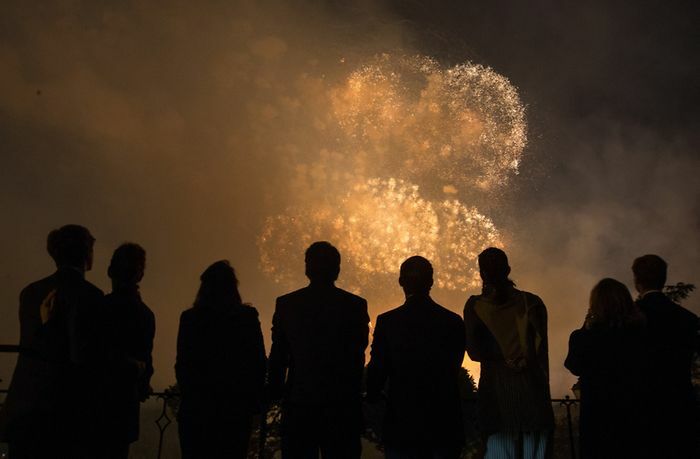 A 17-minutes-long fireworks display rounded off the pre-national day celebrations in Luxembourg last night. After visits to Troisvierges and Esch-sur-Alzette, it was first time for the annual torchlight procession though. Grand Duke Henri and Grand Duchess Maria Teresa, Hereditary Grand Duke Guillaume and Hereditary Grand Duchess Stéphanie, Prince Félix and Princess Claire, Prince Louis and Princess Tessy, Princess Alexandra as well as Prince Sébastien all watched a procession of firefighters and scouts carrying torchlights as well as folklore and musical groups and associations at the Place de la Constitution. A bunch of visuals of the parade can be found at Tageblatt as well as Journal.